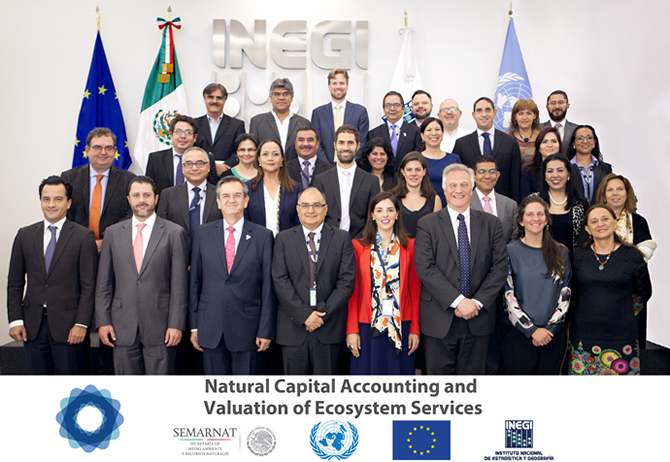 On 13-14 June, the National Institute of Statistics and Geography of Mexico (INEGI, in its Spanish acronym) hosted in Mexico City a high-level meeting and several technical workshops to kick-off the Natural Capital Accounting and Evaluation of Ecosystem Services project. Julio A. Santaella, President of INEGI, stressed that the joint efforts in the implementation of Ecosystem Accounting will provide better information for decision-making based on the valuation of ecosystems, which will in turn allow a more efficient use of resources and a responsible exploitation of national biodiversity and ecosystems. Also participating in this meeting were Vice-presidents of INEGI, Paloma Merodio and Rolando Ocampo, as well as Ambassador Andrew Standley, the EU representative in Mexico. The meeting gathered more than 60 participants from various institutions, including environmental, financial, academic and international agencies. The collaboration of INEGI and other participating institutions guarantees the convergence of both statistical and geographical information and of the environmental and the economic and financial sectors, so that the results of the project will be useful to both sectors alike and the international targets (such as SDG, Aichi, Sendai Frame, climate change) will be achieved. In order to implement this project, INEGI will continue collaborating with Semarnat, SCHP, SE, World Bank, ECLAC, Inter-American Development Bank and GIZ, as well as other institutions such as INECC, CONABIO, CONANP, CONAFOR and CONAGUA. The United Nations Statistics Division, United Nations Environment Programme the Secretariat of the Convention on Biological Diversity and the European Union have launched the project “Natural Capital Accounting and Valuation of Ecosystem Services”. The project, which is funded by the European Union, aims at assisting the five participating partner countries, namely Brazil, China, India, Mexico and South Africa, to advance the knowledge agenda on environmental and ecosystem accounting and initiate pilot testing of the SEEA Experimental Ecosystem Accounting (SEEA EEA) with a view to improving the management of natural biotic resources, ecosystems and their services at the (sub)national level and mainstreaming biodiversity and ecosystems in national level policy-planning and implementation.